Baruch Tenembaum, Sir Nicholas Winton and Eduardo Eurnekian. The Wallenberg Foundation announces that Sir Nicholas Winton, who organised the rescue of 669 children destined for Nazi concentration camps, has died aged 106. Winton was a stockbroker when he arranged for trains to carry Jewish children out of occupied Prague. His son-in-law Stephen Watson said he died peacefully in his sleep at Wexham Hospital, Slough, England. He died on the anniversary of the departure of a train in 1939 carrying the largest number of children: 241. Winton brought the children to Britain, battling bureaucracy at both ends, saving them from almost certain death, and then kept quiet about his exploits for a half-century. 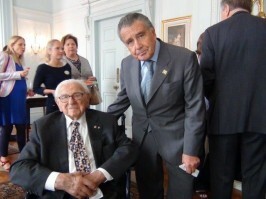 Nicholas Winton and Eduardo Eurnekian. He organised a total of eight trains from Prague, with some other forms of transport also set up from Vienna. Below, an exclusive video of the Wallenberg Foundation with an interview conducted at the Swedish Embassy in London, in 2013.